"My cape arrived in the mail today. Fur Hat World consistently delivers quality products - I am so thrilled with my purchase! 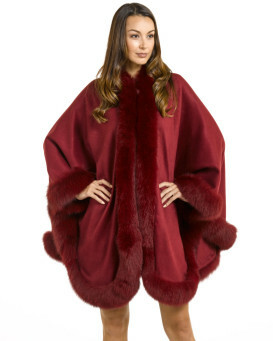 The cape is a true rich, camel color. The cashmere is thin, but will keep you warm. The fur is thick and looks like it will last for many years. 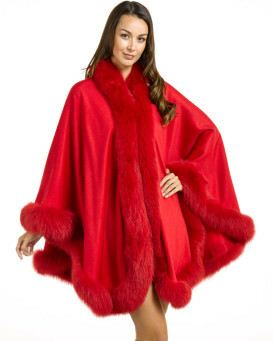 I can't wait for the weather to get a little cooler so I can show off my fabulous cape!" "This is an absolutely outstanding product! I was a little unsure ordering for the first time, but my worries were put to rest seeing this fabulous cape upon delivery. The colour is warm and rich, and the fur is trimmed well to last for ages. I will be purchasing additional colours and styles shortly. Shipping was amazingly quick, and customer service staff is very friendly. Buy without hesitation!" Based on 57 customer reviews.